The deal is expected to close by next Friday, and an auction is already underway for the radio stations and pay TV networks that must be spun off. It’s widely expected that rival broadcast/cable player Cogeco will be a leading bidder, and of course we’ll keep you posted as it develops. *In MASSACHUSETTS – not to mention the proverbial “38 states and half of Canada” that can hear WBZ (1030 Boston) at night – it’s been just over a year since Steve LeVeille departed the weekday overnight shift, leaving a slot that’s been filled by a rotating cast of part-timers including former WRKO (680) host Jen Brien and WBZ’ers Bradley Jay and Morgan White Jr. The slot once filled by Larry Glick, Dave Maynard, Bob Raleigh and LeVeille is officially vacant no more: as of last Thursday morning, it’s now Jen Brien’s full-time home from midnight until 5 AM. While Brien’s being widely billed as the first woman to hold down a full-time talk shift in WBZ’s history, that’s not quite true: veteran Boston broadcaster Janet Jeghelian filled the overnight shift at one point as well, though she’s much better remembered for her years at WRKO. Brien’s selection as the full-time host brought LeVeille back to the WBZ airwaves for the first time in a year, making a ten-minute appearance by phone to pass the crown, figuratively speaking, to his successor. (LeVeille insisted, however, that he and Brien are simply keeping the “Larry Glick Show” alive.) Don’t expect him back as a fill-in, though: he tells NERW that his new life in Maine has him “happy as a clam, fried, steamed or otherwise,” and that he’s keeping himself very busy writing and enjoying the beach. Brien joins a most exclusive club: by our count, there are only a handful of local, all-night talk shows still on the air anywhere in the country. Remarkably, there are none anywhere else in New England; even more remarkably, unless you count the sports talkers at WFAN and WEPN, there are none in New York City, either. As for the other rotating hosts, Jay will continue to be heard on weekends on WBZ as well as on CBS Radio sister station WZLX (100.7), while White will make occasional appearances and do fill-in shifts for Brien. Bradley, who died June 22 in Missouri, came to WBZ from WROW (590) in Albany, and he went on to stints at WCAU (1210) in Philadelphia and then at WHN (1050), WNEW (1130) and most famously WYNY (97.1) in New York, as well as a return to WBZ, before heading west and becoming a star talker at KMOX (1120) in St. Louis in the mid-1980s. After leaving KMOX, Bradley did shorter stints at WIBV (1260) and KTRS (550) in the St. Louis market and then retired to Las Vegas before returning to St. Louis in recent years. *We now know what Alex Langer has in mind for his relocated WMSX (1410): assuming the FCC grants the station’s proposed move from Brockton to a new city of license of Dedham (and a new Readville transmitter site that will be the only AM facility within Boston city limits), WMSX will join Langer’s WSRO (650 Ashland) in programming to the region’s Portuguese-speaking communities. For WSRO, of course, that means super-serving the very fast-growing Brazilian population in and around Framingham; WMSX will serve a more spread-out community that includes plenty of Azoreans and Cape Verdeans. The station plans to hire a Boston-based staff of three to augment the programming coming from WSRO’s Framingham studio. 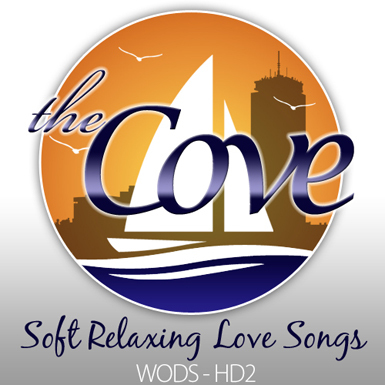 *On Cape Cod, Kim Lucas moves from promotions director to content director at Cape Cod Broadcasting’s WQRC (99.9), WKPE (103.9), WOCN (104.7) and WFCC (107.5). Lucas will be responsible for digital content at the cluster, which also operates CapeCod.com and the World Classical Network. *TV People on the Move: Eric Fisher is moving from the Weather Channel in Atlanta to Boston’s WBZ-TV (Channel 4), where he’ll take over as chief meteorologist in August, appearing on the 5, 6 and 11 PM newscasts on channel 4 and the 10 PM newscast on WSBK (Channel 38). Fisher’s roots are in New England, where he started his career at Springfield’s WGGB (Channel 40) and then did weekends at Boston’s WFXT (Channel 25). Fisher’s return to Boston displaces Todd Gutner, who moves to mornings, in turn sending veteran meteorologist Barry Burbank to weekend mornings. *In RHODE ISLAND, Rhonda Lapham’s been promoted to market manager at Clear Channel Providence, moving up from general sales manager. Lapham will be the first local market manager for the cluster in about two years, taking over from Mary Menna, who continues to oversee the Boston cluster. *It’s been two months since Saga flipped its southern MAINE classic hits station, WYNZ (100.9 South Portland), from “Big Hits Y100” to “Rewind” – and two months since the station’s airstaff was heard from. That changes this morning, when longtime host Chuck Igo returns to the airwaves. Welcome back, Chuck! In Williamsport, the new ownership at WPTC (88.1) is seeking a new transmitter location. As the former Pennsylvania College of Technology station changes hands to the Williamsport Lycoming Broadcast Foundation, it’s applying to move from the college to a tower on the roof of the Market Street building that houses the foundation – and quasi-sister station WLYC (1050), whose translator W281AR (104.1) is also on the roof. WPTC’s move will come with only a slight change in facilities, from its present 490 watts/-310′ to 500 watts/-310′. In the Hanover area, there’s word that Four Rivers Community Broadcasting is now on the air with its “Word FM” programming on new WZXY (90.7 Spring Grove). *Radio People on the Move in Philadelphia: Radio One’s WRNB (100.3 Media) picks up Lady B as its new afternoon host. Down the hall at WPPZ (103.9 Jenkintown), Kyle Glover has been named music director. The Philadelphia market’s newest TV station is getting closer to reality. The former KJWY (Channel 2) from Jackson, Wyoming quietly changed calls to KJWP in March, ahead of its unusual cross-country move to a new city of license of Wilmington, Delaware. In a Wilmington News Journal article on Friday, owner Bob McAllan says the new station will provide local news for Delaware – but he also says the station will go for must-carry on cable around the Philadelphia market, which certainly feeds the suspicion that the new KJWP (if it’s allowed to keep the “K” call when it moves) will follow the lead of other Delaware-licensed TV signals and focuses on serving Philadelphia instead. So far, PMCM LLC (an affiliate of McAllan’s Press Communications) hasn’t changed calls on its other cross-country move, KVNV (Channel 3), which is moving to New York City – er, Middletown Township, New Jersey. Down the coast, there are some staffing changes at Coastal Broadcasting’s Cape May stations: WCZT (98.7 Villas) PD Mark Hunter moves over to the music director chair at “The Coast,” while Jim Maschio takes over as PD, keeping his existing PD gig down the hall at WJSE (106.3 North Cape May). *One of the biggest independent broadcasters in upstate NEW YORK is restructuring its ownership and spinning off one signal. 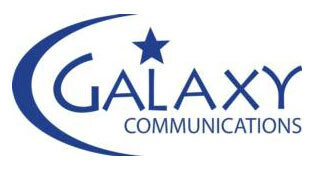 Galaxy Communications is led by Ed Levine, but its financing has come from the venture capitalists at Alta Communications. The deal filed last week at the FCC creates a new “Galaxy Communications LLC” (aka “Galaxy II”), still led by Levine but with about $10 million in debt now being held by Atalaya Special Opportunities Fund. To remain under the caps, Galaxy will sell WZUN to a new group, “WZUN Communications LLC,” for $1 million. That deal is being financed by none other than Atalaya, and the buyer is headed by Wayne Mack, who’s based in Massachusetts and holds two TV licenses in Iowa and Wyoming. Will WZUN remain within the Walton Street studios in Syracuse? There’s nothing in the transfer about any sort of shared-services agreement, but we wouldn’t be surprised. And there’s another interesting wrinkle to this transaction: it may well free up Galaxy to complete a long-thwarted move of WTKV closer to Syracuse. Galaxy figured out long ago that it’s possible, under the FCC’s allocation rules, to change the city of license on 105.5 from Oswego to Granby, on the southern edge of Oswego County. Such a move would typically be followed by a site change that would then make 105.5 more of a Syracuse signal – but it was thwarted by an obscure provision in the FCC rules, “Note 4” of 73.3555. That little twist in the rules prohibits stations that are grandfathered above current ownership caps from changing communities of license, and that meant the dismissal of WTKV’s 2004 application to move to Granby. *Here in Rochester, we now know a little more about Entercom’s plans for W239BF (95.7), the translator it’s acquiring from Family Life Ministries and moving to the transmitter site of WBEE-FM (92.5) on the east side of town. While the translator will officially relay WBEE’s HD2, the HD2 will in turn be relaying ESPN Radio from WROC (950 Rochester), the little AM signal that struggles to reach the eastern and western edges of the county. Will that also lead to more local content on “ESPN Rochester” as it ups the ante in its competition against Clear Channel’s WHTK (1280), which gave up its own FM relay last year? *A follow-up to last week’s story about the sale of Olean’s WVTT-CA (Channel 25): even before taking over, incoming owner Bill Christian is already working on an upgrade. He’s filed to move the station from analog channel 25 to a digital companion channel on RF 34. Up in the Adirondacks, Smith & Fitzgerald wasted no time building out its lower-powered modified CP for WNAK-FM (105.9 Long Lake), which went on the air and filed for a license to cover last week. In eastern Long Island, W219BA (91.7 Ridge) had been off the air since being displaced by new full-power station WEGQ (91.7 Quogue), but it’s now back on a new channel. The translator of CONNECTICUT‘s WSHU-FM (91.1 Fairfield) has a CP to operate with 70 watts at 106.5 on the dial, and until it can get that new directional facility built, it’s running under STA as a non-directional 8-watt signal. *It’s one crazy summer in NERW-land — mid 60s one day, upper 80s the next; rain or threat of rain, clouds that look ominous and thunder and lightning that don’t lead to anything. Wouldn’t it be great if we could control the weather? Until we learn how to do that, we can imagine whatever weather we want by turning to our favorite pages of the 2013 Tower Site Calendar. What? You haven’t ordered it yet? What are you waiting for? 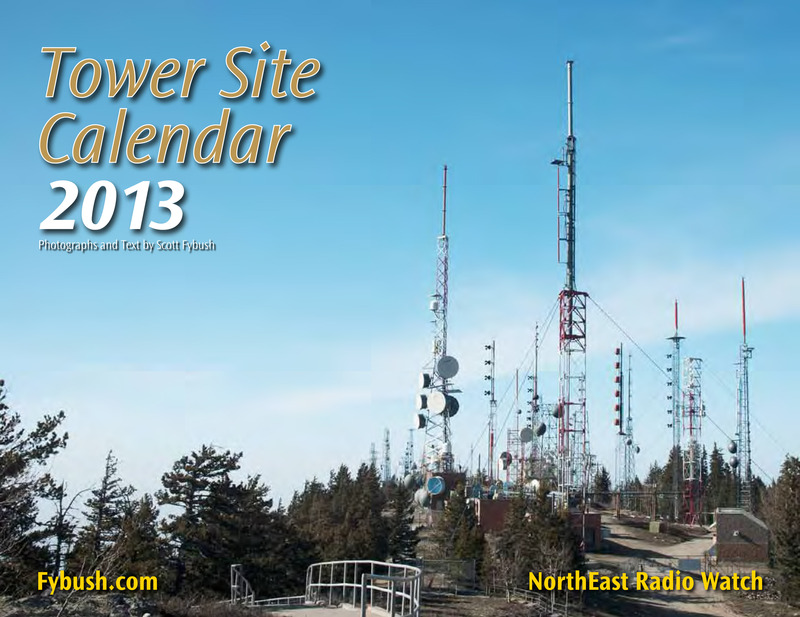 This year’s Tower Site Calendar is now on sale at half price!The 12-month wall calendar boasts a full-color photo each month of a well-known broadcast transmitter site. This edition includes sites in Florida, Wisconsin, Kentucky, California, Iowa, Idaho, Las Vegas, Colorado, Boston, Cleveland, Albuquerque, upstate New York and western Massachusetts. We’ve redesigned the calendar to add more color (don’t worry; the pictures are still pristine) and made the spiral binding standard — it hangs even better on your wall now! Of course, we still have the convenient hole for hanging. When you order the calendar, be sure to check out our other merchandise, including a scale model of the KSAN-AM radio tower. *What was that we were saying just last week about the lack of high-profile rivalries in Boston radio? As of noon on Thursday. there’s a top-40 war underway on the airwaves of eastern MASSACHUSETTS, pitting two of the nation’s biggest broadcasters against each other at the expense of one of the city’s longest-running formats. To listen to the final hours of WODS (103.3) as the clock ticked down to noon, you’d hardly have known that the station that CBS Radio launched as “Oldies 103″ back in 1987 had long since transitioned from 1950s and 1960s oldies to a ’70s/’80s-intensive classic hits format. 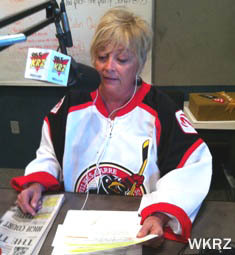 “I’m not closing the book, I’m just turning the page,” morning host Karen Blake told listeners during her final morning show on Thursday, thanking station management for their support, including the recent hiring of co-host John Laurenti. *In 1987, the biggest competition to WODS came from stations called WROR and WMJX, and that was still true (with some big twists along the way) a quarter-century later. The original WROR, the 98.5 station that had originated oldies on the Boston FM dial, had long since segued from AC to hot AC (as “Mix,” WBMX) and had become a CBS sister station to WODS, moving up the dial to 104.1. But the WROR callsign returned to the market on Greater Media’s 105.7, which made its own segue from oldies to a hit-heavy classic rock format occupying a tight demographic niche right between female-friendly WODS and another CBS sister station, male-leaning classic rocker WZLX (100.7). And the battle for older female listeners had become a tight one, too, with WODS complementing WBMX and both competing against the city’s established AC outlet, Greater Media’s WMJX (106.7), which has itself grown hotter in its music programming over the years. 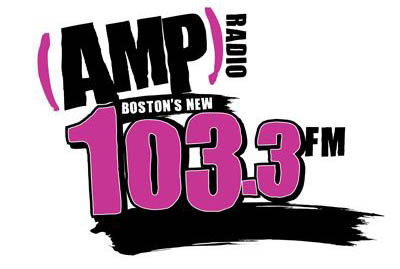 Shifting 103.3 from older-skewing WODS to the much younger-skewing “AMP” is good news for Greater Media, which stands to pick up new listeners to both WROR and WMJX, but it probably didn’t come as very welcome news up at Clear Channel’s Medford-based cluster. Since 1994, when Pyramid Broadcasting bought WJMN (94.5) to bring it under common ownership with WXKS-FM (107.9), that cluster (which has passed from Pyramid to Capstar to Chancellor to AMFM to Clear Channel over the years) has effectively controlled top-40 listening in the Boston market, using urban-leaning “Jam’n 94.5″ to reach the youngest end of that demographic and allowing “Kiss 108″ to skew just a little bit older. *No question about it, it’s sad to see such a long-running format as WODS disappear (among Boston’s commercial FMs, only WMJX and – ironically – Kiss 108 have been around longer.) But it’s also exciting to see a top-40 war in a city that hasn’t really had one in two decades – especially as we wait to see how Clear Channel responds to competition that’s hitting it at a challenging time. We still don’t know what Clear Channel has planned for its new acquisition on 101.7, the soon-to-be-former WFNX; could the end of WODS prompt a shift in plans to oldies on that signal, or could Clear Channel take 101.7 to straight-ahead hip-hop to try to solidify its dominance of that segment of the market? For now, that’s all purely speculative, and we likely won’t know what’s coming to 101.7 until the Phoenix hands off the FM signal July 22 and moves “WFNX” to a webcast…a webcast, as it turns out, that will have some stiff competition of its own. That was the week’s other big Boston surprise, as the Boston Globe announced that it had hired several prominent former WFNX staffers to launch its own alternative-rock webcast via its boston.com platform. The Globe says the new webcast (going, for the moment, as “Radio BDC,” as in “Boston-Dot-Com”) will feature former WFNX jocks Henry Santoro, Julie Kramer and Adam 12, former WFNX program director Paul Driscoll, and operations and promotions director Mike Snow. No launch date has been set, but we’d be surprised indeed if it’s not ready to go right at the same time WFNX says farewell to FM. *We’re still gathering damage reports from the big storm that ripped its way across PENNSYLVANIA, NEW JERSEY and points west and south on Friday. While the worst of the damage was along a line that started in Indiana and then moved eastward into Virginia and Maryland, the storms knocked out power to much of the Jersey shore. Several Atlantic City-market stations were off the air over the weekend, including WMGM (103.7), but there’s no word (at least so far) of any more serious tower damage. *There’s a TV shakeup in NEW YORK City: after seven years as the co-anchor of WNYW (Fox 5)’s flagship 10 PM newscast, veteran anchor Ernie Anastos is being replaced on the late shift. Greg Kelly moves from “Good Day New York,” where he’s been anchoring from 7-10 AM, to take over for Anastos at 10 PM (alongside Dari Alexander) and for Harry Martin at 6 PM. Anastos will continue to co-anchor at 5 PM with Alexander, and Dave Price becomes the new 7-10 AM “Good Day New York” co-anchor. *In an industry full of colorful inventors and entrepreneurs, Leonard Kahn made everyone else look black and white. Widely regarded as one of the most brilliant minds in broadcast engineering, Kahn made a name for himself in the 1970s and 1980s with the development of the Kahn-Hazeltine AM stereo system – and for the pitched legal battle that ensued between Kahn and rival system developers, earning Kahn a reputation as a tenacious defender (sometimes to his own defeat) of his ideas, patents and engineering principles. From his Long Island laboratory, Kahn went on to develop the “Powerside” AM loudness-enhancement system, which was widely adopted in the 1980s, and the “CAM-D” digital AM broadcast system, the full details of which were never disclosed publicly. After the death in 2005 of his beloved wife Ruth, Kahn ended up living in a nursing home in Florida, where he died June 3 at age 86. Jones is scheduled to remain on the air this week to say goodbye to her New York listeners, but beginning July 21 her morning timeslot will be filled with two shows. From 5-7 AM, Hot 97 listeners will hear a local morning show hosted by WQHT swing jocks Cipha Sounds and Peter Rosenberg – and then, from 7-10 AM, they’ll hear the Big Boy morning show from Emmis sister station KPWR (105.9) in Los Angeles. Miss Jones will remain on the air on her Philadelphia affiliate, Radio One’s WPHI (100.3 Media PA), moving production of her show to WPHI’s studios in the Philadelphia suburb of Mequon beginning July 7. Speaking of WPHI, it’s named a new assistant PD/music director, Johnnie Glover. *There’s a format change coming to northwest NEW JERSEY on Tuesday: Clear Channel will flip WNNJ (1360 Sussex) to ABC’s True Oldies Channel, under new calls WTOC. (Those calls have long been in use in Savannah, Georgia on WTOC-TV, and were once on radio there, too, on what’s now WTKS 1290 and WQBT 94.1.) WNNJ had been running ABC’s “Timeless Classics” standards service since dropping locally-programmed oldies last August. *Like everyone else in MASSACHUSETTS this time of year, our attention this week is focused out on the Cape and Islands. Thats’s where WRZE (96.3) has hopped the ferry from its longtime Nantucket home to the mainland. The Qantum-owned station lost the lease on its Nantucket tower site, and it’s temporarily downgrading from class B to class A with a new city of license of Dennis, running 6 kW from the tower of sister station WCOD (106.1 Hyannis) until a new tower can be built for both stations, at which point “The Rose” will go back up to class B1 status with 25 kW. *In VERMONT, the FCC paid a call on Tuesday to “Radio Free Brattleboro,” the unlicensed community station that had been operating very openly in town for nearly five years, initially on 88.1 and more recently on 88.9 (to avoid interfering with the new 88.1 Norwich signal that Vermont Public Radio will soon be signing on) with a few watts that covered the town quite well. 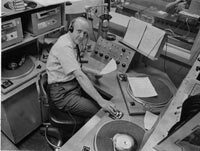 One of the station’s DJs gave the Brattleboro Reformer a video of the visit, in which an FCC field agent ordered the jock on duty to turn off the mixing board and transmitter and threatened penalties if broadcasts were resumed. The shutdown was apparently prompted by two interference complaints, one from WFCR (88.5 Amherst MA) and the other from a local resident; it doesn’t appear that any of the station’s equipment was seized, though the station’s Web site has been down ever since. *NEW HAMPSHIRE is about to get a new nightly newscast. Derry’s WNDS (Channel 50) has hired longtime WMUR news director Jack Heath to put together a nightly half-hour to debut in September. WNDS is one of several New Hampshire stations that used to have a daily newscast, along with WNHT (now WNBU, Channel 21) in Concord and WGOT (now WPXB, Channel 60) in Merrimack. New York had Cousin Brucie. New England had Juciey Brucie as Bradley was affectionately called by teenagers in the 60s at WBZ. Bradley was a superb broadcaster & a great joker to his fellow employees at BZ. Little Dickie Summer is the only one left from that 63-64 era. 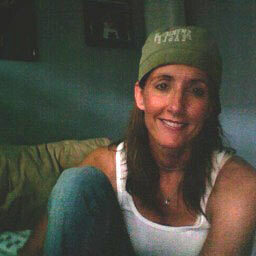 Carl DeSuze, Dave Maynard, Jefferson Kaye and Bruce Bradley now gone R.I.P. to all of them. And thanks for the memories. Dave StOnge liked this on Facebook. Any chance those people hearing commercials on 103.9 were picking up WRCN or WPPZ? Nope. These were commercials that were very clearly part of WPDI’s very distinct format…or so I’m told. Their media kit (at radioasiafm.com) goes pretty far beyond your usual noncommercial underwriting opportunities, too. By chance, I viewed a brief “going away party” for Eric Fisher on The Weather Channel this very morning (Monday, 07/01); I wanted to feel better about 80-plus degrees and a Floridian-style humidity index as opposed to the triple-digit heat west of the Mississippi. They replayed video od his “greatesy hits”: standing knee-deep in the snow somewhere, hanging on to something to avoid being blown away by a hurricane, the usual stuff. As CHIEF meteorologist, he’ll be standing infront of a giant monitor at ‘BZ (they do not use a green screen any more I understand) so others will be out in the “elements”. (Why do they call them elements when the atmosphere and water itself are compounds mostly…the oxygen component of the air is O2. Sorry to hear about Bruce Bradley. I listened to him from Boston and New York over the years, One thing puzzles me though. I had a vacation in New Hampshire in August 1959 and WBZ was already playing top 40 material. Baby Talk by Jan & Dean, Bongo Rock by Preston Epps, I’m Gonna Get Married by Lloyd Price, Here Come Summer by Jerry Keller, etc. That doesn’t jive with the 1960 launch mentioned here.